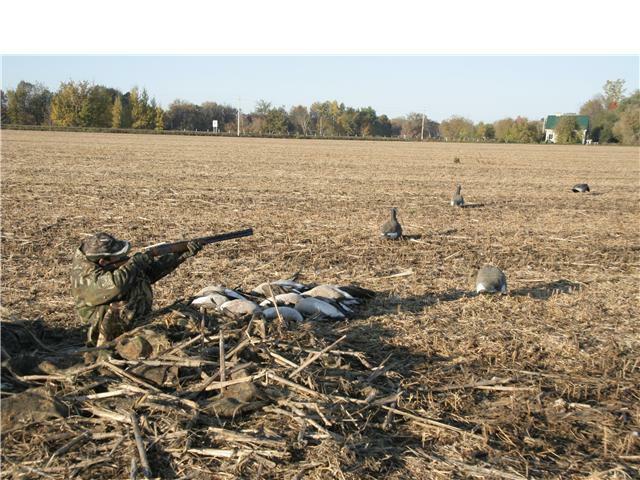 This entry was posted in Canada goose hunting and tagged Canada geese, Canada goose, Canada goose hunting, field hunt, German Shorthaired Pointer, Hunting, hunting seasons, Nicholas Marion, Waterfowl hunting, waterfowlers, waterfowling on September 23, 2014 by geoffreyandmika. 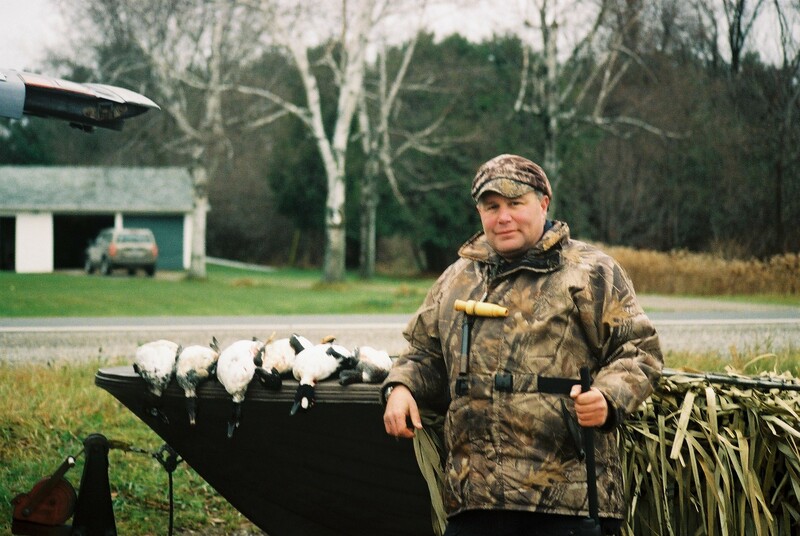 Here are some entries from my hunting diary written down during the 2008 season. These entries show that hunting is easy. 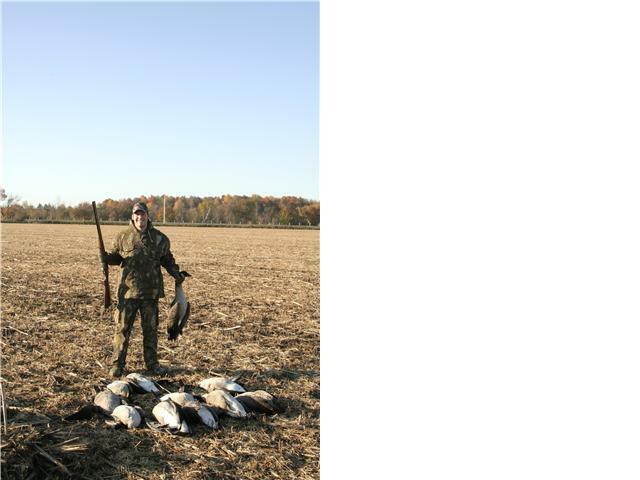 The weekend of November 15-16th 2008 was taken up with waterfowling and gundog training. I was up at 0300 Saturday morning making ready for waterfowling on the Tay River with Omer. I was ready and waiting with my boat at 0400, the time we were to meet, only to be kept waiting 30 minutes for Omer to show up. Despite this late start, we arrived at the Tay, launched and set up at the western tip of the marshy island in time for shooting time. There was a great flurry of ducks early on, a mix of goldeneyes and puddle ducks. Omer shot a passing black duck right away, quickly followed up with a drake goldeneye. I missed spectaculary on several occasions, but managed to down three drake goldeneyes, one of which was a lively cripple we thought was lost, but tracked down, shot and retrieved on our way back to the launch site. I was able to lure in a few flights of mallards with my calling, but they stopped short of decoying. 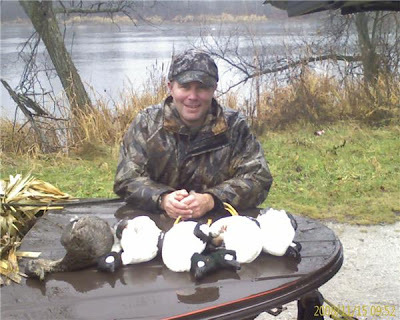 We had several flights of goldeneyes and singles come to my decoys. 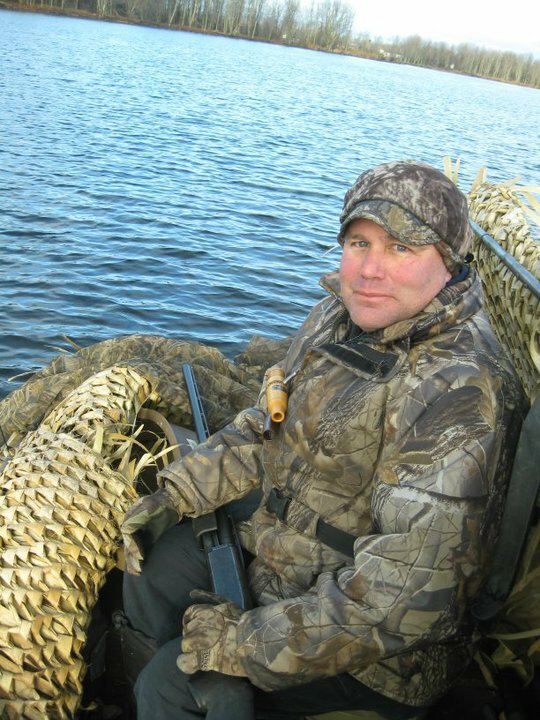 Kudos to Barry Cowan who carved the goldeneye decoys for me. They are so life-like that I mistook a cripple for one of the decoys. The temperature was in the double digits, which is unusual for mid-November, and I was sweating under my warm clothing. There was a light rain which held off until we picked up at about 0900. Got out with Juno, Nicolas and his German Shorthaired Pointer Cocotte, to the Larose Forest Sunday morning. We started at Ridges, the girls had a good run together. No grouse were flushed. Moved on to Grouse Central, again no grouse were flushed. I am well pleased that Juno took to hunting with Cocotte with no hesitation. She heard pistol shots from the range at the edge of the forest too and was not bothered. It looks as though she is well on her way to becoming a fine gundog. I made it out to the Tay River on Monday, but navigating the river proved to be as frustrating as ever. I made it out to the spot I selected with a little less trouble than the previous outing, but still had a hard time making my way through the shallow water and muddy sand bars. I put out my goldeneye decoys and five puddlers in a good spot, just beyond the marshy island. I was set just in time for the start of legal shooting time. A flock of several mallards landed by the opposite shore across from the goldeneye decoys, well out of range, right off the bat. I saw and heard lots of goldeneyes flying high over head as the the morning progressed. I made some spectacular misses on a couple of decoying singles, not goldeneyes, then killed a decoying mallard cleanly. I missed spectacularly on a pair of passing Canada geese. Forgot how to shoot a station 8 shot. I was daydreaming and failed to notice a flock of goldeneyes had come swimming into the left side of the decoy spread. Just as I finally noticed a swimming muskrat spooked them. They got away cleanly as I did not shoot at them. Morning flight was slower than in other seasons. I picked up the decoys at about 0930. I had noted where the downed mallard was. He was just off the tip of the marshy island. He had gone down in a long glide, bounced off the water once, then fell dead on the water. He drifted to the opposite shore. To my dismay I found the water to shallow to navigate and too deep and mucky to wade, so I was unable to retrieve the bird. 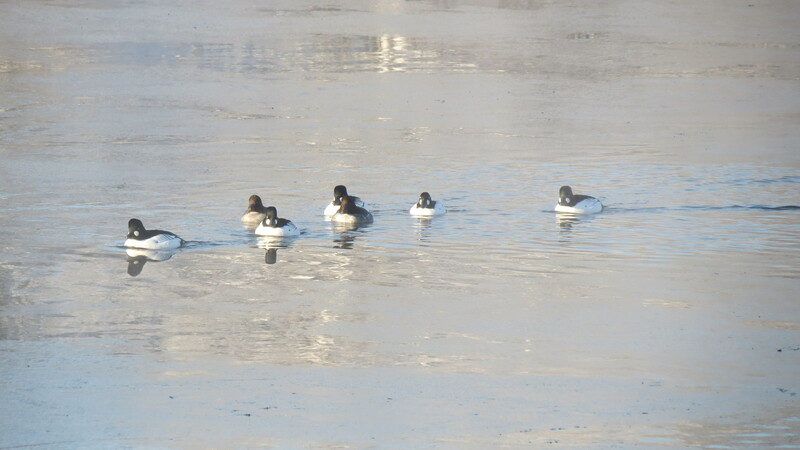 Then as I was busy picking up the goldeneye decoys a flock of live goldeneyes deigned to drop in next to them. Typical. Getting back to the launch point proved to be a struggle. 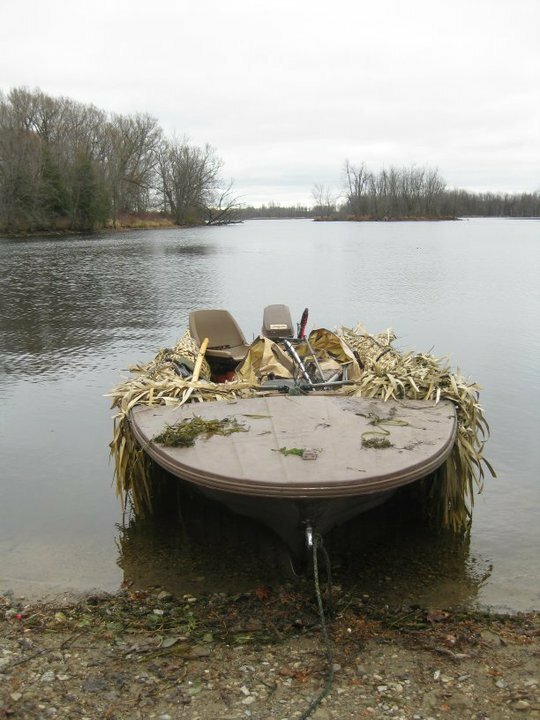 I really need to learn how to operate the outboard motor in shallow and weed infested waters before next season. This entry was posted in Brittany (dog), Dog training, Duck hunting, Gun dogs, Hunting dogs, Pointing dogs, Ruffed grouse hunting, Small game hunting, Upland bird hunting, Woodcock hunting and tagged Brittany (dog), common goldeneye, coverts, duck hunt, duck hunting, German Shorthaired Pointer, German Shorthaired Pointer Cocotte, goldeneye (duck), goldeneyes, Larose Forest, Ruffed grouse, small game hunting, Tay River, upland game, upland gunning, Waterfowl hunting, waterfowlers, waterfowling, Woodcock, woodcock hunting on September 23, 2014 by geoffreyandmika.